Chiricahua is an Opata Indian word that means “wild turkey.” The Opata are native to northern Sonora, Mexico, south of Arizona. 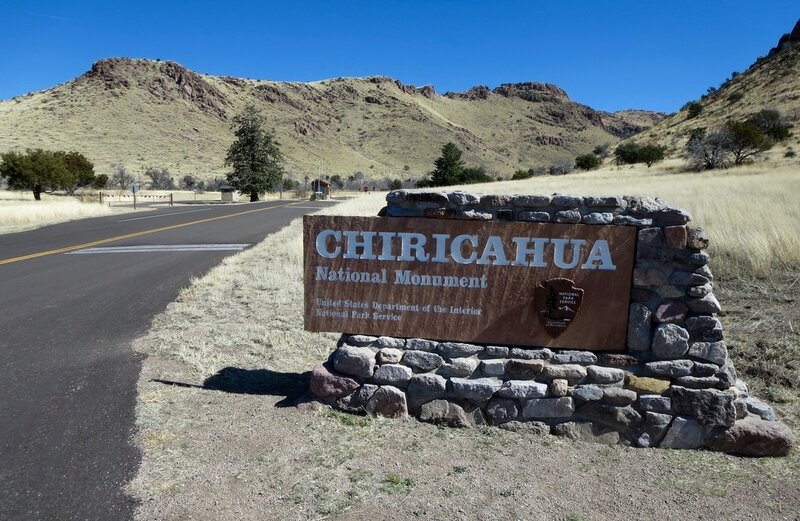 Chiricahua, a national monument since 1924, is described as a sky island — a mountain range that rises up from a high desert grassland from an elevation of 5,100 to 7,300 feet. The remote park, 120 miles southeast of Tucson, is just less than a mile high at its entrance station. Bonita Canyon Drive ascends over 8 miles to 6,870 feet at Massai Point. That’s the end of the road but is the jumping off point for most of the parks 17 miles of trails that traverse an area known as the Wonderland of Rocks. Search out Balanced Rock, Punch and Judy Rock and Inspiration Point. These are relatively short hikes with moderate elevation changes. A shuttle runs in the morning from the visitor center for hikers who want to descend the 1.5-mile Lower Rhyolite Canyon Trail back to the center. Pets are prohibited on the trails, with designated exceptions. A wildfire burned through the park in 2011 and left significant scars on the landscape. Chiricahua is home to the Faraway Ranch, which Swedish immigrants, Neil and Emma Ericskson, started in 1888. Their daughter Lillian and her husband Ed Riggs turned the property into a guest ranch with a swimming pool that operated from 1917 to 1973. Check at the visitor center for tours of the historic ranch. Bonita Campground within the park features 26 campsites in a shady grove with picnic tables and flush-toilet restrooms. There are no fire rings on the ground and campfires are restricted to elevated cooking grills. It’s a restriction I’ve never encountered in more than 40 years of camping in state and national parks. The campsites can accommodate recreational vehicles of up to 29 feet. Chiricahua Apaches called these formations "standing up rocks." center includes a bas-relief bronze plaque recognizing the work of the CCC and showing the workers in a rather heroic light. 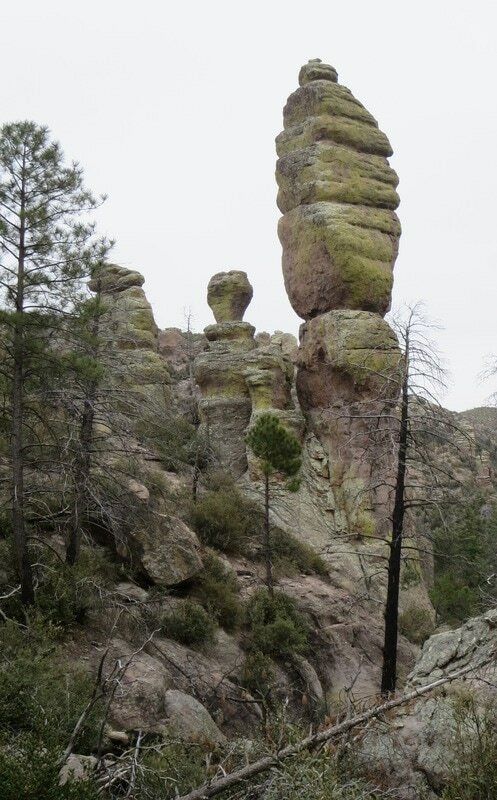 ​The best times to visit Chiricahua are spring and fall. It gets quite hot for mid-summer visits and below freezing with some snowfall in winter. We camped in early March and had expected mild weather but temperatures ranged from the 30s to 50s, quite cool by Arizona standards for spring. Finally, Chiricahua’s remoteness is an asset. It keeps visitation down to just 51,000 in 2016. Plus, the drive past Doz Cabezas in southeastern Arizona is beautiful, wide open country. The 2011 Horseshoe Fire burned 223,000 acres within the park and left charred remains but there is still plenty of greenery, including lichen on the rocks. 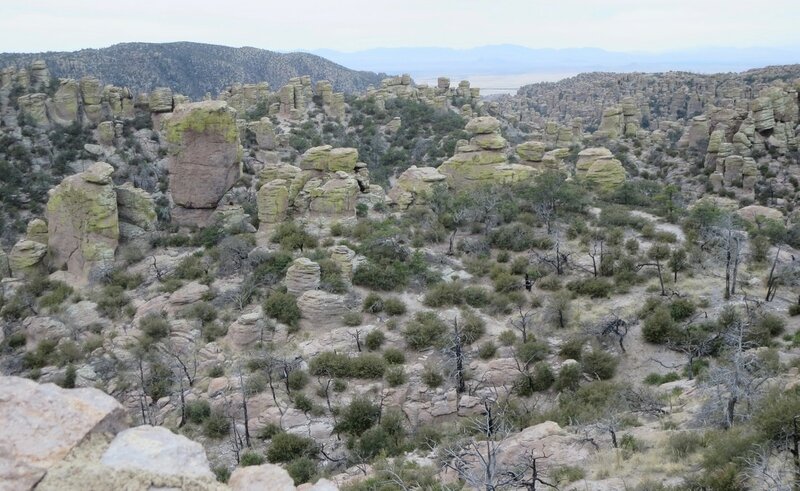 Chiricahua National Monument in southeastern Arizona ranges from an elevation of 5,124 feet at the entrance station to 6,870 feet at Massai Point. A hiker appears to embrace a trail below Massai Point on a chilly day in March. The park has about 17 miles of trails offering a variety of terrain. State Route 186 southeast of Dos Cabezas covers 35 miles of open road from Willcox to Chiricahua National Monument. Civilian Conservation Corps built park features in the 1930s at Chiricahua. Its legacy is memorialized at the Visitor Center.